In the following article in the Herald.ie, fears that Dublin Zoo, an award-winning state project from 2005 by the OPW, may be affected by pyrite are discussed. We wonder will the public restaurant be closed due to health and safety concerns in light of possible structural issues mentioned? Inadequate market policing by Local Authorities and lack of additional resources allocated for quarry regulation by Minister Hogan and the Department of the Environment have sparked fears that recent incidences of pyrite re-occurring are widespread in the industry. Professional Certifiers are concerned that they may become liable for defective materials. Due to the State’s lack of action on pyrite many professionals fear they have been made the single-point of responsibility under the new building regulations for an area they see as being the remit of the Department and Government. Many consumers and home-owners see no change to the regulatory system since the first examples of pyrite affected homes appeared over 6 years ago. 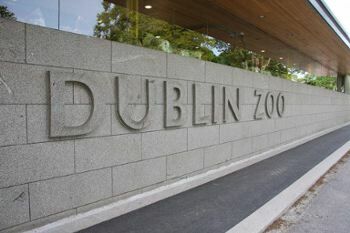 DUBLIN Zoo has engaged engineers to determine if worrying cracks in buildings at the site have been caused by pyrite. The cracks were noticed in recent months in the zoo’s offices and Meerkat Restaurant area, and a decision was taken to call in experts to establish if they present any sort of indication of structural damage. Specialist measuring equipment has been placed across a series of the cracks to see if they are widening over time or if they have stabilised. A spokesperson for Dublin Zoo confirmed the tests are taking place, but added that the process would take time and results were not yet available to identify the cause of the defects. “A routine check is being carried out in the office building and restaurant area of Dublin Zoo at the moment,” said the spokesperson. “There are small cracks in the main office building and restaurant area which we are monitoring. “We are checking for all possible issues, including pyrite,” they added. There are no reported cracks in the areas where animals are enclosed, and no threat of any escapes by potentially dangerous species. Neither is there any threat to the safety of people using the buildings being examined. Pyrite has caused havoc to many buildings in recent years, at a huge financial cost. The mineral, which has been found in some of the stones that are used in the foundations of buildings, expands slowly when it is exposed to the air, causing walls to shift and crack. If it is found pyrite is the problem it could lead to expensive works to put things right. Problems with pyrite first came to prominence in recent times in 2007 after the massive celtic tiger building boom. Residents in some houses in estates in Drynham in Kinsealy, Myrtle in Balgriffin and Beaupark in Baldoyle were among the first to notice cracks in their newly-built homes. Investigations led to the discovery of the mineral in the infill in their foundations which expands as it oxidises, and pushed up floors as well as moving walls. It has been estimated that the ongoing cost of repair could be €70,000 for each house affected. In 2012, pyrite was discovered in three national schools in Dublin, St Patrick’s in Diswellstown, Castleknock, St Canice’s Boys school in Finglas, and St Peter’s in Phibsboro, which was extensively refurbished in 2007.